The latest issue of Smithsonian Journeys Travel Quarterly, called the “Atlas of Eating,” features travel articles related to food, such as “How Food Became Religion in Peru’s Capital City” and “The Humble Beginnings of Goulash.” Editor Jeff Bartholet invited me to contribute something about art and food, so I put together a short history of food’s appearance in art, but, honestly, deciding what to include was a challenge. I started with Marinetti’s cookbook in 1909, circled back to Giuseppe Arcimboldo, Cezanne’s fruit, Wayne Thiebaud’s desserts, Dieter Roth’s Staple Cheese (a Race), Miriam Schapiro and Judy Chicago’s Womanhouse, The Dinner Party, Rirkrit Tiravanija, and a few contemporary painters including Jennifer Coates, Walter Robinson, Gina Beavers, and more. Here’s an excerpt. 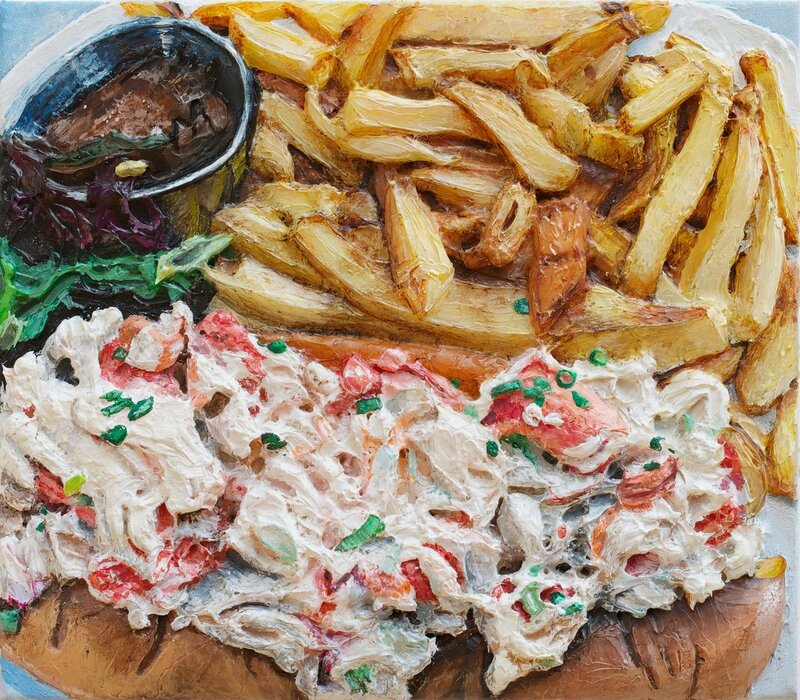 Gina Beavers, Lobster Roll, 2013. When I think of food and art, intuitively I recall the big, beautiful still lifes of the Dutch golden age that I first encountered in a northern Renaissance art history class. In these glorious paintings, each surface, from the glistening feathered coats of duck carcasses on shiny silver platters to the dewy skin of fruit and berries, is carefully rendered to create the illusion that the feast is sitting right in front of the viewer. In the 1600s, such paintings attested to the owners’ wealth and intellectual engagement. The foods depicted had symbolic significance often related to biblical texts, and how the objects were arranged—and which had been consumed— conveyed a message about the fleeting nature of time or the need for temperance…. In 1970, the sardonic Swiss-German artist Dieter Roth, also known as Dieter Rot, made a piece titled “Staple Cheese (A Race)”—a pun on “steeplechase”—that comprised 37 suitcases filled with cheese, and other cheeses pressed onto the walls with the intention that they would drip, or “race,” toward the floor. A few days after the exhibition opened in Los Angeles, the exhibition gave off an unbearable stench. The gallery became overrun with maggots and flies, and public health inspectors threatened to close it down. 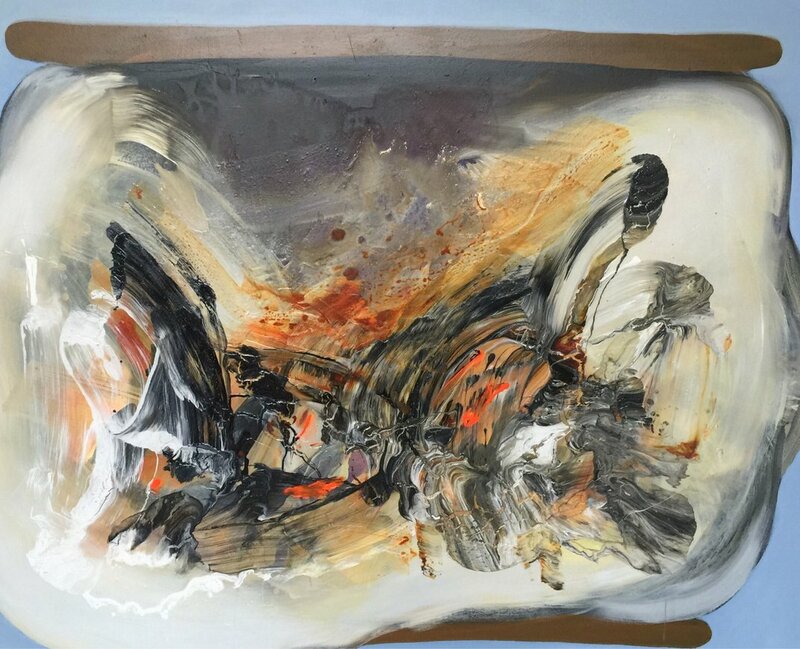 The artist declared that the insects were in fact his intended audience….. Read more.